Many construction options - including ‘no welding’. So simple to build! So strong! Easy to dismantle! Skill level - medium wood working. Precise cutting, or get it professionally milled. Welding is needed for only one of the carriage options. The other carriage option is wood only (and also very strong). 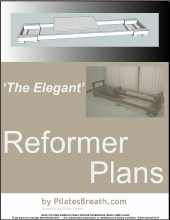 The key to this reformer is getting 2 long hardwood runners. As long as they are very high-quality,knot free, straight, and 100 kiln-dry, the reformer should be strong and durable. I have used standard 2x4 (1.5 x 3.5 inch) hardwood in 5 machines over 12 years, and none have warped or broken. Get two good pieces of wood and you will have a great machine!